The next SAIDI Meeting is planned for Wednesday 16th October 2013 when the National Executive Committee will meet from 12:00 to 14:00 and a General meeting will be held from 14:00 to 16:00. Contact Info@saidinational.org for more details. Tuesday 22nd October 2013 at 13:00 – Gauteng Forum for Driving Schools to sign the Terms of Reference document. Please see the Syntell Sustainability 2013 forum invitation to a conference on 11, 12 and 13 November. Members are welcome to attend. Stakeholder’s meeting on Thursday 3rd April 2014 with Gautent MEC for Roads and Transport. See more about the event. Click here. 7th Annual Leadership for Women in Law Enforcement Conference to be hosted at Gallagher Estate Midrand from the 28th , 29th & 30th May 2014. Contact info@saidinational.co.za for more details. 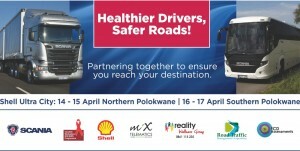 Scania Easter Safety Promotion 14 and 15 April Northern Polokwane, and 16 and 17 Southern Polokwane. SAIDI supports all efforts to improve road safety in our huge country! Congratulations to Scania for what they are doing.